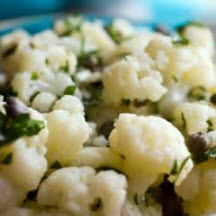 CooksRecipes has quality, kitchen-tested recipes for delicious salads featuring cauliflower as a main ingredient. 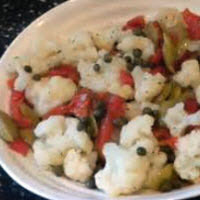 The tender cauliflower contrasts well with crunchy sweet red peppers and chewy raisins. 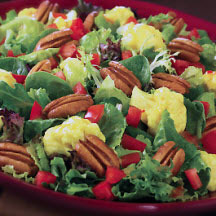 Serve this tangy salad warm or cool. Recipe courtesy of Georgia Pecan Commission. In the Naples area of Italy this salad is called Insalata di rinforzo, meaning it is particularly nutritious and re-invigorating.